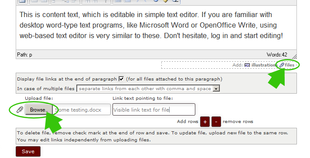 Adding documents to website is not much different of using them as attachment on your e-mails. 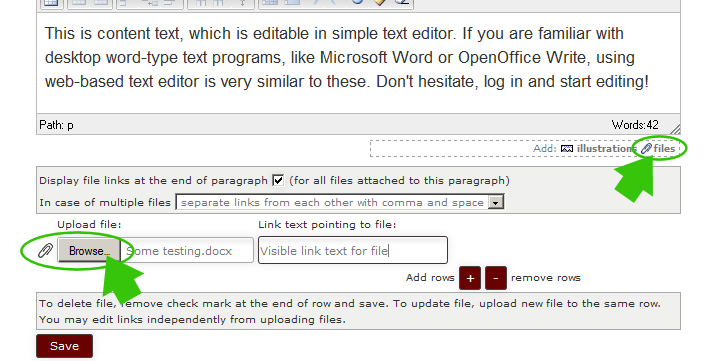 To upload document file to website, go just to "Paragraph: Edit" => "Add: files" dialog and choose files from your computer. After pressing "Save" button, document files will be uploaded to web server and link appears automatically in the end of text. Number of files you may add to the webpage is not limited. Just click "+" sign to add rows for uploading more files. You may add many common document formats, like .pdf, .doc, .docx, .xls, xlsx, .rtf, .odt, .ods and other well known extensions. How fast is your site? Check here. Ask a Quote for website design. Nobody likes slow website. For building fast web, you need solid and reliable website platform. Important is to host site to fast UK Web hosting server. We tested many UK Web Hosts and measured error rate and speed of web hosting servers. For reliable results, see UK web hosting firms we suggest. All UK Web Hosting companies are independent firms, with own terms and conditions as well as privacy policies. Some UK Web Hosts stipend us. Upload files in Content Management To upload document file to website, go just to "Paragraph: Edit" => "Add: files" dialog and choose files from your computer After pressing "Save" button, document files will be uploaded to web server and link appears automatically in the end of text Adding documents to website is not much different of using them as attachment on your e-mails.